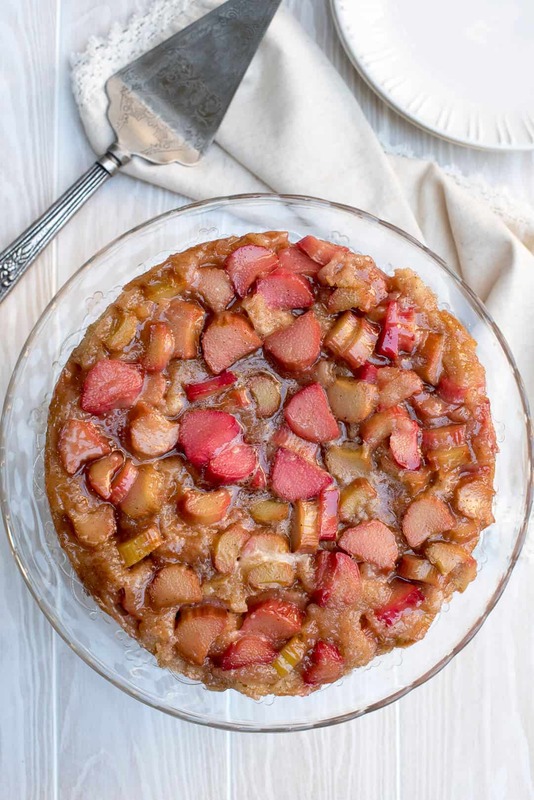 This tart-sweet Rhubarb Upside Down Cake is both elegant and rustic at the same time. It’s a uniquely delicious dessert! Rhubarb is weird, you guys. It looks like giant pieces of reddish/pink celery from outer space and I honestly can’t imagine how someone ever decided it should be baked into a dessert. But, whoever took that leap, thank you from the bottom of my heart. 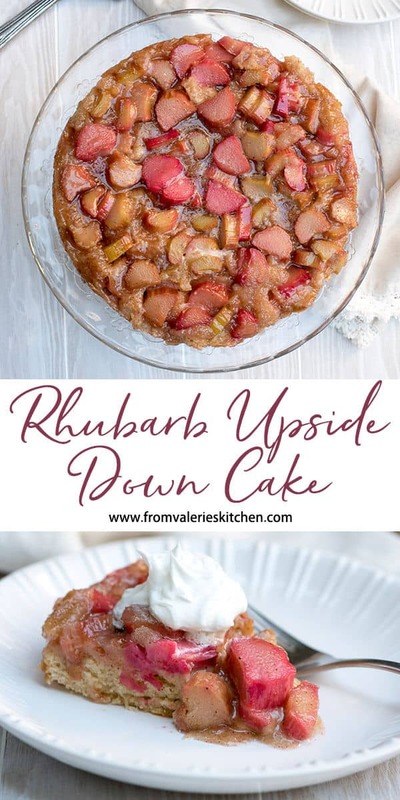 I’d made it this far in life without baking one gosh darn thing with it but I put an end to that the day before the 4th of July with this completely scrumptious Rhubarb Upside Down Cake. The first attempt was demolished by my family overnight so I baked a 2nd cake the very next day. Always a good sign. This is a uniquely beautiful, old-fashioned cake that I thought was just perfect for serving on the 4th of July. I just love that no matter how much cooking and baking I do, there’s always something new to try. I am now officially a huge fan of rhubarb and plan to broaden my horizons with more recipes using this unusual veggie which apparently is actually classified as a fruit but everyone knows it’s actually a veggie. Peak rhubarb season runs from April through June, but fear not! 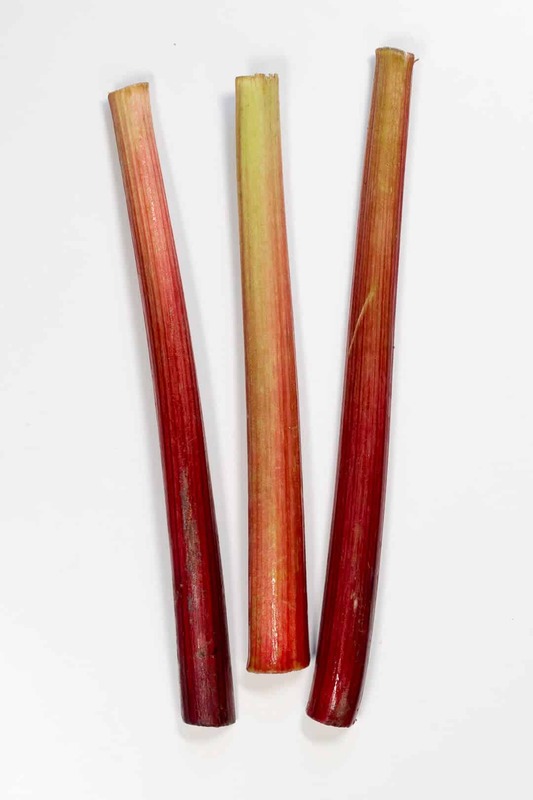 You will most likely be able to find rhubarb in the produce section of your grocery store through August and possibly even September. Pick stalks that are crisp and firm and have good color. They will stay nice and fresh for up to a couple of weeks if kept refrigerated. I bought mine with every intention of baking this cake right away… and then life happened. I was surprised to find how fresh and crisp the stalks remained tucked away in the produce drawer in my fridge for well over a week. Probably the weirdest thing I learned about them is that the green leaves are poisonous. They aren’t typically attached if you buy it at the grocery store, but it’s important to note that if you grow it yourself or buy it at the farmer’s market and it hasn’t been trimmed, you need to trim the stalks by about an inch and discard the green leaves. 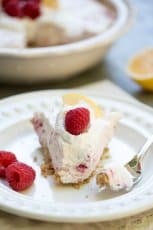 Their flavor is quite tart but in a really wonderful way when baked into sweet pies, tarts, crumbles, crisps, and cakes. 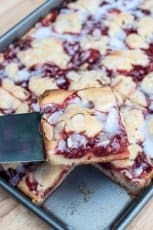 I’ve seen recipes for cocktails made with rhubarb syrup which I think I need to try ASAP. After washing and trimming the stalks, slice them into 1/2″ pieces and scatter them across the bottom of a springform pan that has been generously coated with non-stick cooking spray. Next, a mixture of sugar, flour, cinnamon, and a touch of nutmeg is sprinkled over the top. Don’t be tempted to skimp on the sugar. Rhubarb needs a good dose of sweetness. The sugar and spice topped rhubarb is drizzled with melted butter. And, a simple cake batter is spread out over the top. After the cake comes out of the oven it should be inverted on to a serving plate and then it will release easily from the springform pan. This cake is overwhelmingly a new family favorite. One of my guys said it is his new #1 cake which is big, people because there have been lots and lots of cakes in this house. 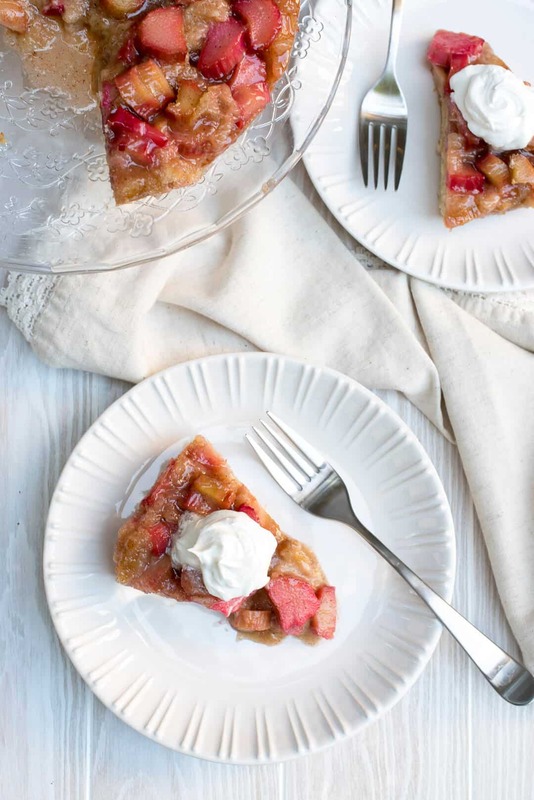 This tart-sweet Rhubarb Upside Down Cake is both elegant and rustic at the same time. It's a uniquely delicious dessert! Preheat oven to 350 degrees F. Coat the bottom and sides of a 10" springform pan generously with non-stick cooking spray. Scatter the sliced rhubarb over the bottom of the prepared pan. Combine 1 cup sugar, 2 tablespoons flour, 1/2 teaspoon cinnamon and 1/4 teaspoon nutmeg in a small bowl and sprinkle it over the rhubarb. Drizzle 1/4 cup melted butter over the top and set it aside. For the batter, in a large bowl, beat 1/4 cup melted butter and 3/4 cup sugar until blended. Beat in the egg. In a separate bowl, combine the flour, baking powder, cinnamon, nutmeg and salt. Add about half of the dry mixture to the egg mixture and beat just until combined. Add half of the milk and beat again until combined. Repeat with remaining flour mixture and milk, beating well. 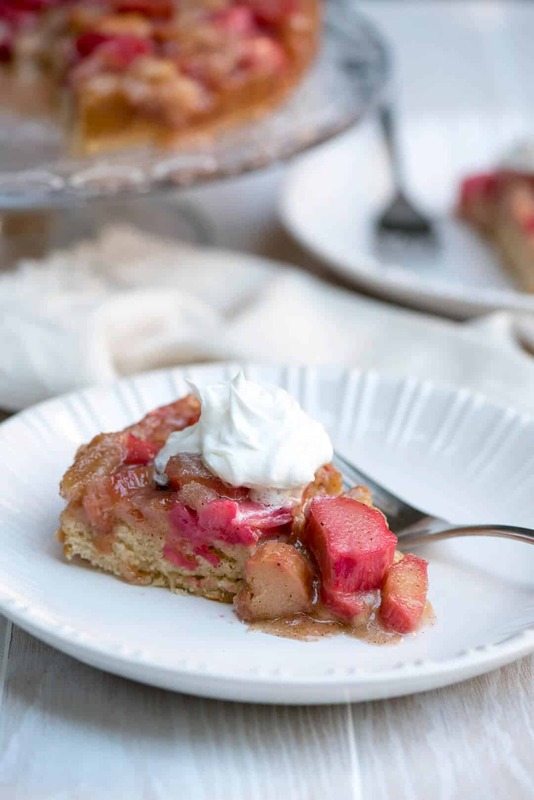 Spoon the cake batter over the rhubarb mixture and use an offset spatula or the back of a spoon to spread out evenly. Bake for 40 to 45 minutes or until golden brown and a toothpick inserted in the center comes out clean. 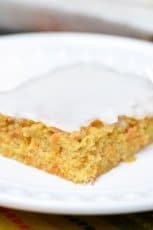 Remove from oven and run a knife along the edge of the cake and the pan to loosen the edges and then immediately invert onto a serving dish. Unlatch and remove the sides of the springform pan. Use a knife to lift up the base of the pan and remove it. 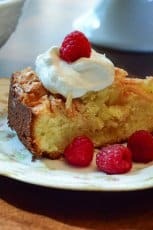 Allow to cool for about 10 to 15 minutes and then slice and serve warm with whipped cream, if desired. Rhubarb should be trimmed by about 1" at each end. Trim and discard green leaves. Wash well and slice into 1/2" slices.